Dr. Bader is certified to administer Botox as well as dermal fillers, such as Restylane. These treatments remove unsightly creases and wrinkles by relaxing and smoothing out your skin. As we mature we lose some of the elasticity in our skin. It’s perfectly normal. However, if you’re like most people, you don’t like the resulting lines. There’s more at stake here than a simple desire to look better. Some employers may be less likely to hire applicants who appear older. It can also give people the wrong impression of your personality or result in a misunderstanding of your feelings toward someone. 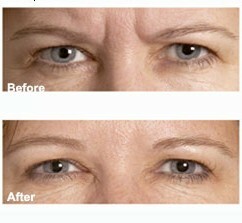 Looking at the picture to the left you can see in the before picture the woman looks angry. But that’s the result of lines which have appeared over the years. After treatment with Botox, her face looks happier and more pleasant. Botox injections are made of neuromuscular inhibitors, relaxing the muscles which create lines and tension in your face. Though the treatment takes about ten minutes, the injections themselves only last seconds. You’ll start to see results between three and five days and continue to improve for 30 days. Those final results will last for between three and six months. Immediately after treatment, you can resume your normal activities with two exceptions. You’ll want to avoid strenuous exercise and lying down for the first four hours following treatment. When that time is done you can do anything you want. There are two brands of dermal fillers in common use—Juvederm® and Restylane®. Both of them use a natural compound called hyaluronic acid which bonds to water. It will retain the water under your skin which smooths out the creases, making you look younger. As you can see from the pictures below, the folds in the skin around her mouth are filled in looking smooth and natural. Each treatment will last between eight and twelve months. Since hyaluronic acid occurs naturally in the body, there is very little chance of any sensitivity reaction or other negative effects. If you’re interested in using Botox or a dermal filler, you may contact our office to schedule an appointment or, if you prefer, you may click here to request an appointment online.